At Bonfire, our goal is to make you the hero of your community by providing amazing t-shirts and rocking designs! We review every design that is uploaded onto our site and work directly with our customers to make sure their design will print just right. 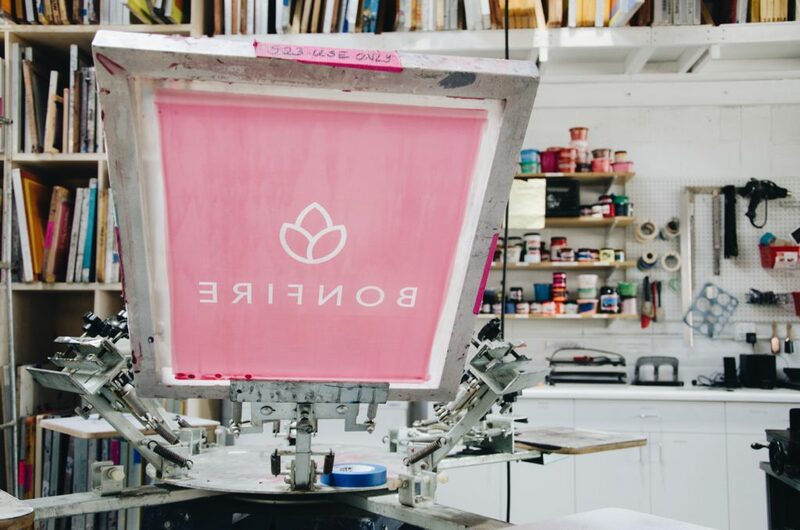 Our production team handles each and every design from start to finish to make sure that every Bonfire t-shirt becomes someone’s new favorite tee. So what does this design review process look like? 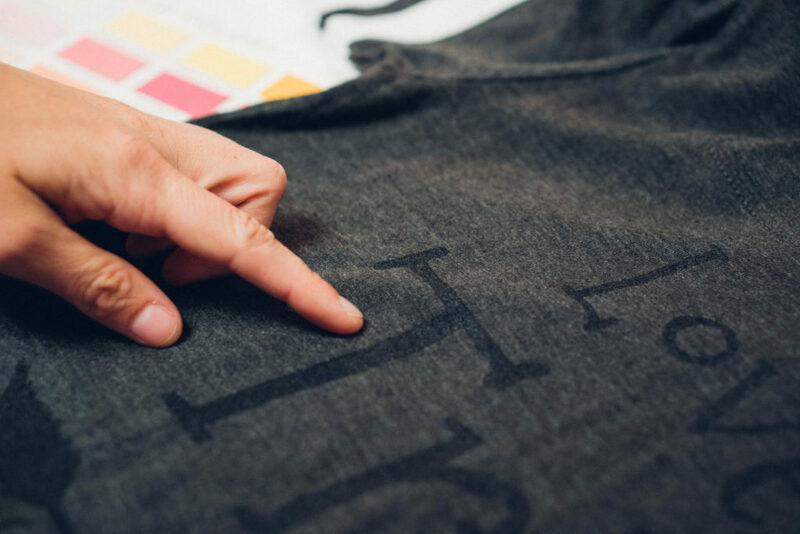 Our production team breaks it down step-by-step to show you just how much it takes to get your t-shirt design ready for printing! Once a batch tips and is ready to print, we do a Color Check. In this step of the design review process, we look at the uploaded artwork and make sure that it will print well on all of the chosen products. We are looking specifically for dark ink being printed on dark shirts, and cases of “color on color”, such as red printing on red, or neon ink on a neon shirt. What if I want to print black ink on a black shirt? Or neon ink on a neon shirt? We are more than happy to print whatever you need to be printed. Our goal is to make sure you know what your design will look like so that you, and just as importantly, your buyers are happy with the results. We can talk together to see what design colors will be most successful for you. 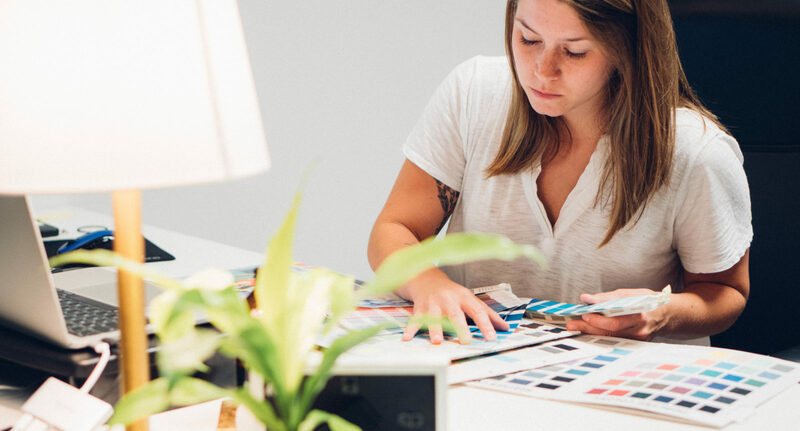 If one of these issues is flagged, a team member works with the customer to ensure we switch out ink colors or shirt colors to increase the contrast between the t-shirt and the ink. Our goal is to make sure that all elements of the design can be seen, and all text can be read on each and every t-shirt item sold in that campaign. 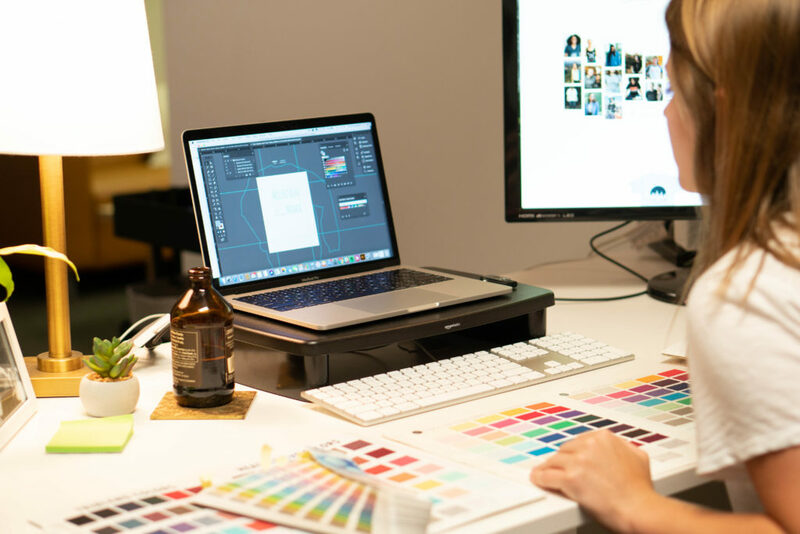 Once any design issues have been flagged and resolved, we pass the design off to our team of t-shirt designers to prepare the file for printing. In the screen printing process, each color is printed separately. Thus, we have an 8-color limit. 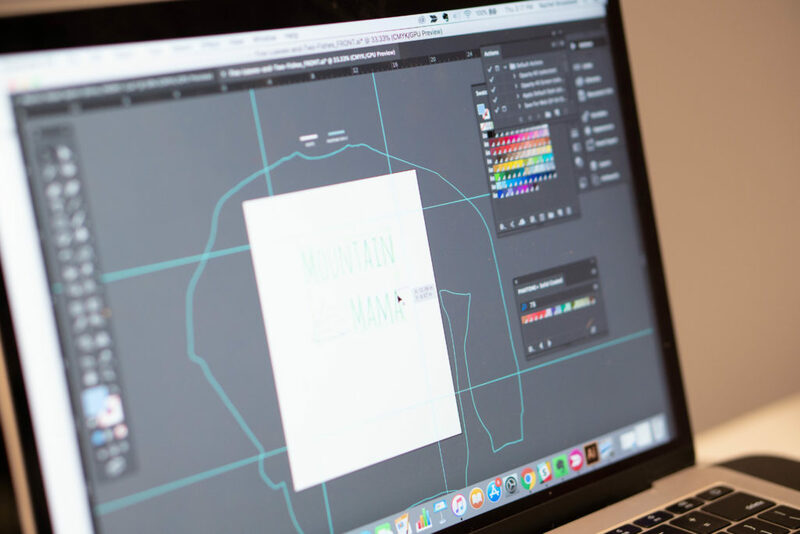 We use the flat file that was uploaded to the website to create a layered, editable file, where each color can be separated out for the screens to be created. 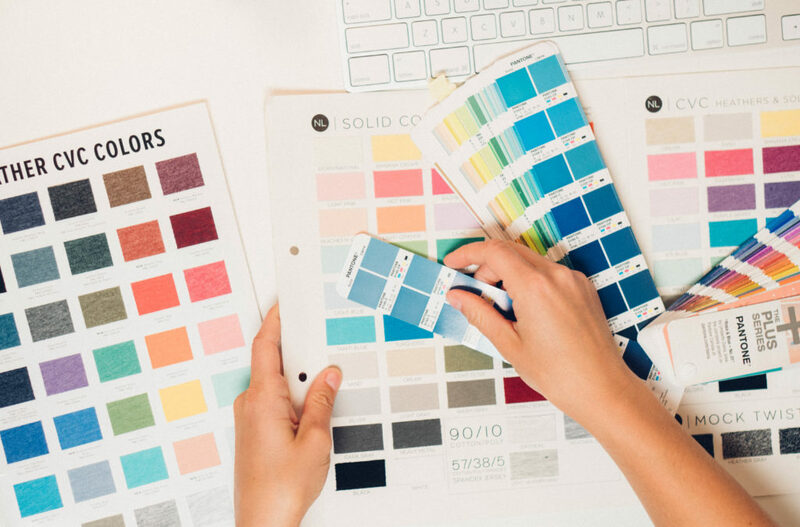 Once the design has been layered by color, we assign Pantone colors to each color present in the design. When artwork is uploaded to our Design tool, the image is made up of colors in the RGB digital color space. But the inks are mixed in the Pantone color space. Thus, we must match each of your colors to the best Pantone conversion. We work carefully to find the closest Pantone match, but there can be slight differences in the color on screen and in print. Skin colors, as well as lighter colors, are challenging to convert to Pantones. But we work with our customers to make sure we find the best option for them from the ink colors available. Also, if a design is using two very similar ink tones, we can suggest dropping one of the colors in order to save money on the design. Can I upload a photo to the design tool? Photographs are difficult to work with because they contain thousands of colors. When our designers reduce the colors from thousands to 8, it transforms the way the photograph looks. It loses much of the detail in the original photograph, and colors are often difficult to match. My uploaded design is a very small file, will it work? We recommend uploading a file that is at least 800 px by 800 px, but the minimum file size that’s uploadable is 200px by 200px. If your file size is small, Bonfire will completely recreate and clean up the artwork you upload. We smooth lines, trace elements, and sometimes re-draw the design so that the image isn’t pixelated when printed. Can I upload a photograph of a hand-drawn sketch on paper? Drawings on paper must be digitized and flattened. Our team can help with doing that process, but it will lose some of that “pencil” texture. In most cases, shading and gradients are not possible to reproduce in screenprint. In rare cases, however, we are able to get that effect in print. We will work with you to find the best solution for your specific design. I created my design in a professional design program. Can I upload Ai files or .eps files? We LOVE when our customers can provide AI files for us. You can now upload your AI files right into the design tool to simplify the design review process! View more details about uploading your artwork here. Football Jersey Tee: We ensure nothing prints on or above the seam that goes across the upper chest and back of the garment. Hoodie: We check to make sure designs are placed high enough on the hoodie to not be printed on the front hand warmer pocket of the hoodie. Slouchy Tanks: These products have lower cut fronts and backs, so we look to make sure that the design isn’t placed too high up on the shirt. In this step of the design review process, we also check for text placed outside of the printable area. We cannot print on sleeves, or along the very bottom of a t-shirt. Once the design is print-ready, we send a final proof to our customer. When a user creates a campaign, this proof doubles as an image that can be used as a promotion tool on social media. When a user places a Supply order, we send them a proof document. We also check the numbers of colors used (screens to make) to make sure it matches up with what’s listed in our system so that users pay the correct base cost. Once the design review process is complete, we send the files and the order details over to our printing department. Shirts get printed within a few days, and are shipped directly to your customers, or you when ordering via Supply! If you are ever not fully pleased with the way your Bonfire shirts were printed, please let us know at support@bonfire.com. We work day in and day out to be the best place to buy and sell custom apparel online. Got questions about our design review process? Email us!